Social media has the power to change the world and increase your knowledge base efficiently since it is proving to be a sea of knowledge with unknown depths yet to be conquered. Some major social media platforms such as Facebook, Twitter, Linkedin, and Google+ exploded in popularity to every corner of the earth while many more new are coming to every day. And while there are millions of business present, the right way to promote your business on any social media is still unclear to many fortune 500 entrepreneurs and SME owners. In this blog post, we are going to discuss on how to promote your business on twitter. In our previous post, we have already told you on how to increase your facebook page post reach. There are few ways which can differentiate you from other business profiles on twitter. Let’s learn few ways on how to promote your business on twitter. The main factor to the registration process is using the right set of keywords when updating your biography section. You have to be clever enough as like every other area of Twitter you’re restricted in the number of characters you can use. Most members use various search engines to track down relevant people who are experts to the unique query they are searching for to follow so use search terms you think will be popular. If you’re targeting SMEs, for instance, include ‘small business’, ‘small businesses’, ‘SMEs’, ‘entrepreneurs’ etc. Equally, if you’re after clients or customers in a particular locality include that as a keyword. Like other online communities such as forums and groups, the key to making the most of Twitter is demonstrating that you’re an expert in your field and you have the knowledge and courage to sort out the problems of the user. Keep an eye out for particular issues you could help with by scanning tweets or using a twitter search engine. If people recognize that you know what you’re talking about and you’re willing to offer bits of advice for free they are much more likely to do business with you. And always check the ‘@replies’ section on the right-hand side of your Twitter page. This section lists the people who have tweeted directly at you so you can respond. You could also type your username into a Twitter search engine to see whether there are people who you aren’t following have been talking about you. This is much needed to promote your business on twitter. Ensuring you tweet on a regular basis is key to building a good community. One way to make sure this happens even when you’re busy doing other things is using a service which sets up pre-scheduled tweets for particular times in the future. There are several sites which allow you to do it but our personal favorite is Hoot Suite. Adding that much needed human element that we keep on forgetting nowadays to your tweets will build a personality around your business and avoid people keeping the perception of a faceless organization as well as it is the need of the time to promote your business on twitter. Representatives of any organization for instance post under their real names plus the company – e.g. yournameatorganization which is a good idea. For example, in my case, it can be danishatweblizar. You should also post about non-business issues too although avoid anything too salacious or very personal. As well as responding to other people’s questions you should also ask some of your own. You can’t know everything and it will encourage some community interaction. Be clever to do a bit of market research and ask questions directly related to your business or sector. With much to say and having a limit of 140 characters seems unfair sometimes but that is what separates twitter from any other social media platform, it’s important you’re as succinct as possible while at the same time getting your point across. If you’re including links to websites use services such as TinyURL which allow you to shorten URLs. Other services like ow.ly and bit.ly also allow you to track how many people click on your links. If you’re new to Twitter you may be confused by the regular use of ‘RT’. This stands for retweeting which is the reposting of particular tweets from other people on your page which you find particularly interesting or useful. It’s worthwhile doing this as it demonstrates to your followers you’re not here only to promote your business on twitter but you’re also willing to share tips and advice. Retweeting may also encourage a particularly influential member to start following you. Just because you’re on a train or at a conference without a laptop doesn’t mean you can’t tweet. Download the twitter app from the app store or playstore to keep yourself updated on what is running hot out. This also allows reacting instantly to particular events. 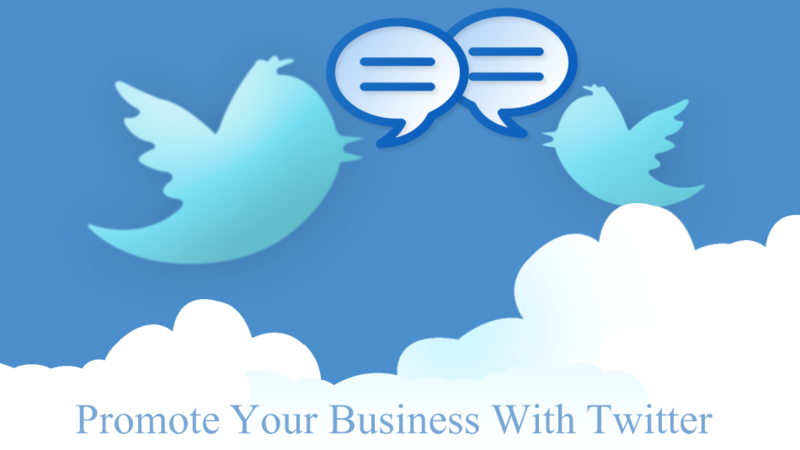 There are thousands of people using Twitter who could be particularly useful to your business. While Stephen Fry, Britney Spears, and MC Hammer may be entertaining with their celebrity revelations, it’s the people who can directly benefit your company you want to be following. There are several ways to track them down. Via the Twitter search engine, you can search tweets for people who are interested in the areas you cover. In addition, Website Grader grades your profile against the entire Twitter community as well as giving you a list of the top tweeters in your locality and Twellow.com lets you search members’ biography, name, job title, and location. Don’t go overboard with promoting your business by bombarding your followers with links to your website as it will be treated as the Twitter equivalent of spam and encourage people to stop following you. By all means link to your website or blog but say something interesting about it rather than just dumping a link. It is also a good idea to post tweets about subjects not linked to you or your business since it creates interest in other genres of people who aren’t in your niche. Following these procedures will certainly give your organic twitter marketing a boost. Hope I was able to deliver the content according to the subject. For any query, you can comment below and I’ll be more than happy to answer. Apart from that if you haven’t read about our recently launched product Appointment Scheduler Pro which allows you to manage all your appointments ans schedules with just few clicks, read about it.